Rose Mary Graveline works at the University of Vermont, Graduate Counseling Program, as administrative staff. 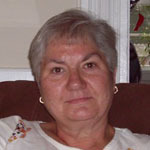 She is a native of North Carolina and moved to Vermont in the late 1960s. By the 1980’s she developed a passion for genealogy, which ultimately lead to the discovery of her grandfather’s military service as a Buffalo Soldier and interest in the soldier’s stories. She hosted a “Vermont Buffalo Soldier Descendant Reunion” in July of 2007. Participants included 7 grandchildren, two great-grandchildren and one great-great-grandchild of 10th Cavalry soldiers who remained in Vermont after retirement or discharge. Dr. Frank N. Schubert, author of On the Trail of the Buffalo Soldier II: Biographies of African Americans in the U.S. Army, 1866-1917 (Lanham, Maryland: Scholarly Resources Books, 2004), also attended the reunion.